From The Atlantic, this is one of the weirdest stories I’ve heard in a while. Actor/karate expert Steven Seagal recently led a Congressional Delegation to Chechnya that included U.S. Reps Michele Bachmann, Steve King, and Steve Cohen. This is certainly an odd group – Bachmann and King are right-wing wacko birds, while Cohen is a stalwart liberal from an African-American community in Memphis – but the story gets even weirder. The purpose of the trip was to find out more information on the alleged perpetrators of the Boston Marathon bombings, who, although they were not born in Chechnya, identify deeply with the country and its struggle for independence. 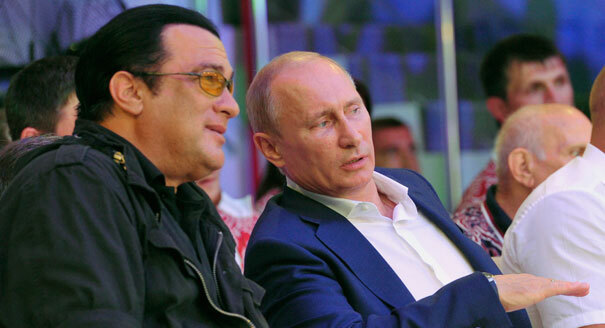 “Seagal…is also chums with Kadyrov and Putin. Here’s a video of him dancing what he thinks is a native Chechen dance in Grozny as the smiling ginger warlord looks on and claps…Seagal is seen by Russian officialdom as incredibly important and deferred-to back home. Russian Deputy Prime Minister Dmitry Rogozin identified him as the perfect candidate to help abolish a U.S.-Russian agreement that restricts the importation of Russian firearms into the United States. “I believe that your authority and connections within the American establishment could help resolve this issue,” Rogozin told Seagal in March during the latter’s visit to Moscow…. It strikes me that this is mainly a case of two entities desperate for attention forming a mutually beneficial PR agreement. The appeal for Seagal is easy to understand. He has been on the D-List for years, his turn as a real-life deputy sherrif on Steven Seagal: Lawman not withstanding, and he and his agent would surely welcome the very brief return to relevance this trip will secure him. It’s pretty similar to the factors that drove Dennis Rodman to cavort with Kim Jong Un last month. But I think there is more to unpack in the relationship between these two fading stars and countries that have been associated with Communism. Seagal’s films, of course, were packed with the kind of Cold War themes which were common in action movies of the Reagan Era and were created by a unique partnership between the Pentagon and Hollywood to aid recruitment. Vietnam featured prominently into his character’s backstory in Above the Law. His biggest hit, Under Siege, lamented the ramping down of the Cold War. So it is easy to understand why Russia would identify Seagal as a key figure in American culture: because they are holding onto the era in which both he and they were bigger players on the world stage. Dennis Rodman, it should be noted, also starred in an action movie with an icon of that era, Jean Claude Van Damme. I suppose it’s possible that Russia and North Korea would prefer the company of bigger celebrities and have had to settle for the likes of Seagal and Rodman, but their presence there feels oddly congruous. So I wouldn’t attach too much significance to seeing American celebrities hanging out with war criminals like Chechen President Kadyrov. At least not until someone more relevant than Dennis Rodman does it. Steven Seagal Joining ‘Expendables 3′ After All?